'Post' Hack To "Get With My Gays, Learn About Sensitivity"
After reading this morning's analysis of the latest Sean Delonas crime against art an irate reader sent an e-mail to Delonas expressing his displeasure with the cartoon, its depiction of homosexuality, its conflation of homosexuality with pedophilia, and Delonas' talents in general. The reader also suggested that he planned to bring the cartoon the attention of national gay rights groups. We share Delonas' response after the jump. Thank you for your email. 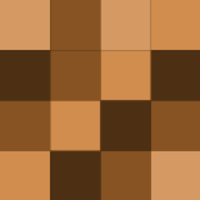 Sorry you don't like my cartoons. If you don't like them, then why do you bother reading them? In my opinion, McGreevey, like Foley, is a real sleazy character. The fact that both these men are gay is irrelevant. I have many gay friends. I've done many pro gay cartoons. I've personally raised money for several AIDS organizations. I'll try to be more sensitive to the issues you pointed out in the future. If you want to attack me with the gay rights groups or the national media that mentioned in your email, that is your right (which I respect). Okay, putting aside the fact that Delonas plays the "I have gay friends" card, ignoring the claim to have done pro-gay cartoons (Anybody ever seen one? Frankly, we're a little scared. ), and dispensing with the tired "if you don't like it, why read it?" 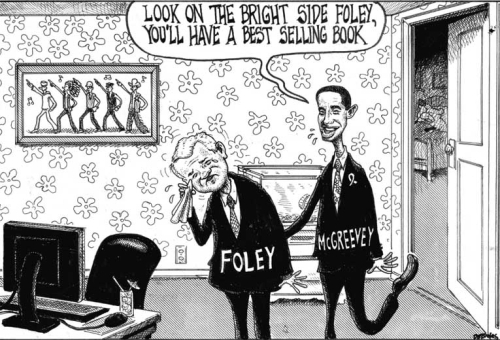 argument, let's just look at this: "In my opinion, McGreevey, like Foley, is a real sleazy character. The fact that both these men are gay is irrelevant." It needs not be said that every single element in this panel with the exception of the signature (although certain commenters have raised doubts about even that) is a grossly offensive homosexual stereotype. If a cartoonist, even one with talents as limited as Delonas, merely wanted to convey that Foley was, like McGreevey, "a real sleazy character," he could have simply conveyed that by showing the two men working at 1211 6th Avenue.